Wednesday nights in lower Manhattan’s SoHo district have gotten a little saner. 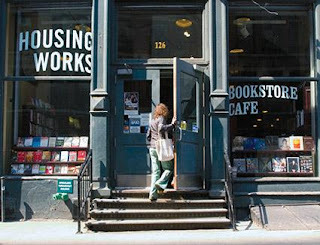 The Housing Works Bookshop Café, which donates 100% of its profits to Housing Works, Inc., a social enterprise, is offering psychotherapy to its customers and neighborhood denizens in three-minute doses for those whose therapists are on vacation or who require a quick jolt of personal problem advice. You’d think that three minutes wouldn’t allow enough time for introductions much less delving into the dark recesses. But Jonathan Fast, one of the eight psychiatrists and psychologists who staff these Wednesday nights and who is also a professor at Yeshiva University, asserts that “What I have discovered is that these brief conversations absolutely turn into real therapy. You start with the classic ‘What can I help you with?’ and make a really fast assessment." It’s a very popular event at the Housing Bookshop Café, which has established a strong neighborhood presence by providing citizens with a great deal of “value-added” to the bookstore experience. So popular, in fact, that traffic control is necessary. The classic Waiting Room is now the Waiting Line. Lianne Stokes, a free-lance writer who is the event’s emcee and traffic cop, recently became annoyed when a session went well beyond the allotted time by an eternal, infernal thirty seconds and had to lay it on the line to those on line: “Move the line, people. Believe it or not, someone here has worse problems than you do, if you can imagine,” she announced through her microphone. It’s like being at a book signing and the guy at the front of the line hands the author ten first edition copies for signing: a hog-like Me! Me! Me! abuse of privilege and courtesy. Instant advantage: No browsing through eight-month old copies of Time, Field and Stream, APA journals, Penthouse, or the Daily Racing Form in the waiting room of your shrink's office. Plenty of up-to -date and actually interesting reading material abounds at the Housing Bookstore and Cafe. And the standard waiting room silent assessment of whether others are as crazy or crazier than you now becomes a festive, communal on line experience. Confidentiality? Schconfidentiality! We're all in the Mental Muck together. It must be a bit dispiriting, though, when the Speed-Shrink inevitably declares, “Sorry, our time is up” before we’ve even finished stretching the neurotic muscles and gotten our psycho-blood freely circulating. “We’ll pick it up next session. No cutting in line, please." Nice piece about the Housing Bookstore and Cafe in today's New York Times.